The Risk Dashboard was designed for compliance users to review and monitor the risk score of trades, cashflows and options. To access the Risk Dashboard, click on Compliance > Risk Dashboard in the navigation pane. Before transactions are monitored in Kooltra, the Transaction Risk Monitoring App must be enabled and set up in Entity > Entity Settings (Apps tab). For more information about enabling and configuring the Transaction Risk monitoring app, please review the help guide here. The risk dashboard organizes the risk scores into three separate cards - Cashflows, Trades and Options. By default, this dashboard displays all high risk transactions that have not been reviewed. Filters are available at the top of the page allowing you to change the transactions that appear on the dashboard based on Risk Score (High, Medium, Low, All), Reviewed Status (Yes, No, All), and Maturity Date. Details about each transaction can be found by clicking on the blue Details link on the rightmost column of each card. This will open a popup that summarizes the Risk Level (Low, Medium, High), the Risk Score, and any flagged factors. The factors that may flag a transaction are unauthorized currency, size, and frequency. Additionally, individual scores (size, frequency and account) that are used to calculate the Risk Score are summarized in the bottom half of the card. Transactions can be reviewed (marked as safe) and have comments added to them. If a transaction is marked as High Risk, then you will be required to add a comment before you are able to mark the transaction as reviewed. 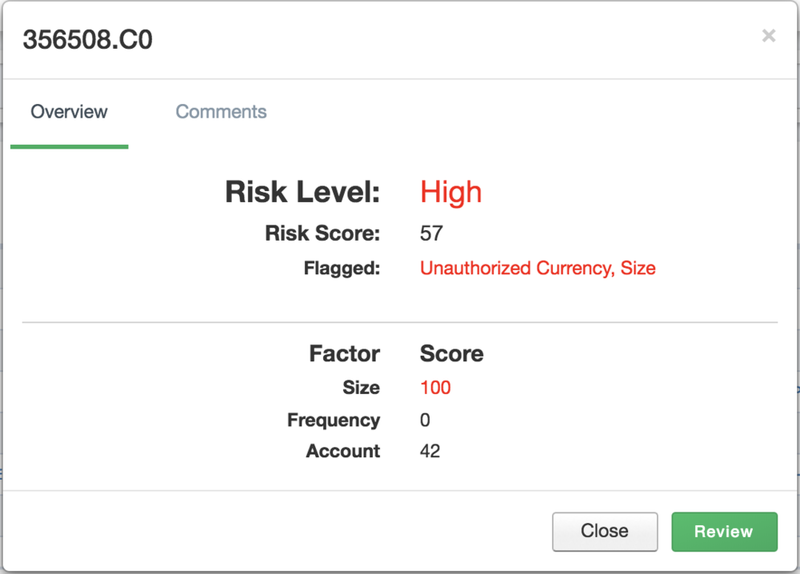 To add a comment, navigate to the comments tab in the Risk Details card. Note that once a transaction is reviewed, you will only be able to see this transaction on the risk dashboad if you set the Reviewed filter at the top to All. Information about how risk scores are calculated can be found in the Transaction Risk Monitoring app help guide. A maturity date is the date a transaction will settle. For cashflows, trades, and options, the maturity date represents cashflow value date, trade value date and option premium date, respectively. Why am I not seeing a recently booked transaction on the risk dashboard? The risk dashboard calculates risk scores every few minutes. If you have just booked a transaction, this transaction may not immediately show up on the risk dashboard.